Demeter, Persephone, and Triptolemus in Ancient Art. Demeter, as the goddess of the fertility of the earth (especially ripe grain), succeeded Ge and Rhea. She does not therefore have the clearly defined mythology that most of the other Olympians have. (Hestia is another exception.) 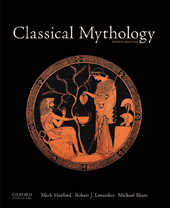 Demeter’s unique narrative myth is the loss and recovery of Persephone, and therefore much of her mythology is shared with or defined by her daughter. Demeter begins to appear on Greek vases in the mid-sixth century B.C. She is seated or standing, robed and sometimes holding a torch, a reference to her search for Persephone. She appears twice on the Parthenon sculptures: on the east pediment she and Persephone (identified by the chests on which they are seated) await the news of Athena’s birth, and on the east side of the frieze she is seated between Dionysus and Ares, holding a torch. Her role as the mother of earth’s fertility, who loses her daughter in the eternal and annual cycle of death and rebirth, is most profoundly expressed in the seated statue Demeter of Cnidos (ca. 340 B.C., now in London), the cult statue from her sanctuary at Cnidos. On a red-figure vase (ca. 440 B.C., now in New York) she is shown waiting for the return of Persephone, who rises escorted by Hermes and led by Hecate, holding two torches. Demeter and Persephone (the latter holding a torch) are shown instructing Triptolemus on a marble relief from the sanctuary in Eleusis (ca. 430 B.C., now in Athens). On a red-figure vase by Makron (ca. 480), she stands behind Triptolemus while Persephone faces him and pours from a jug: each goddess holds a torch. Triptolemus is seated on a winged and wheeled throne (also equipped with a bearded snake), which is more elaborate than the wheeled throne on a black-figure vase by the Swing painter from about fifty years earlier (now in Brussels). Demeter herself is shown climbing into a chariot on several vases. Postclassical Demeter. A Demeter by David Sharpe (1982, present location unknown)—while it shows that the tradition of the enthroned goddess still is alive (see Demeter of Cnidus, above)—is both witty and disturbing. In postclassical art Demeter (usually called by her Roman name, Ceres) is frequently represented as an allegory of the fruitfulness of the earth, as in a painting by Jacob Jordaens, Offering to Ceres (ca. 1620, now in Madrid). She so appears in the masque in Act 4 of Shakespeare’s The Tempest (1611), in which she is joined by Juno (Hera), who guarantees the fruitfulness of the marriage of Ferdinand and Miranda. An oil-sketch by Rubens, The Union of Earth and Water (1615, now in Cambridge, Massachusetts: the finished painting is in St. Petersburg), focuses on the fruitfulness of the earth and the sea in the same spirit as the myth of the union of Poseidon and Demeter. The primitive notion of the connection between the earth’s fertility and human motherhood has been profoundly revived in the abstract sculpture of Jean Arp, whose marble Demeter (1960, copies in Scarsdale, New York, and elsewhere) by its swelling curves expresses the renewed fertility that is described at the end of the Homeric Hymn to Demeter. Cybele, Rhea-Cybele, and Demeter. The Phrygian mother-goddess, Cybele, was early identified by the Greeks with Rhea and was worshiped in the Agora at Athens, where her sanctuary was called the Metroön (i.e., sanctuary of Meter, the Mother) and contained a famous statue (destroyed in the third century A.D.). Rhea-Cybele shared Aphrodite’s functions as goddess of human procreation, but she came to be closer to the Greek Demeter as goddess of the earth’s fertility. Her worship was marked by ecstatic dancing and music, sometimes culminating in self-mutilation by her followers. Cybele's consort is Attis, whose ecstasy, self-castration, and devotion to Cybele are portrayed with unparalleled emotion and profound insight by Catullus (translated in MLS, Chapter 9). Cybele is shown in art wearing a turreted crown and accompanied by lions, which may be crouching beside her throne or drawing her chariot. Cybele came to Rome in 204 B.C., where she was known as the Magna Mater (Great Mother). Vergil (Aeneid 6. 784–86) likens the future Rome to Cybele in her prosperity, her fertility, and her universal rule. In postclassical art Cybele is common as an allegory of political stability or human fertility: these motifs are combined in a painting by Rubens in the Medici cycle (1624, in Paris), The Birth of Louis XIII, where Cybele stands centrally behind Marie de Medici. Rubens used her in a number of designs for engravings, for example, the title-page of the Pompa Introitus Ferdinandi (Antwerp, 1642), in which her attributes (turreted crown, lion, orb, and scepter) glorify the imperial rule of Spain.